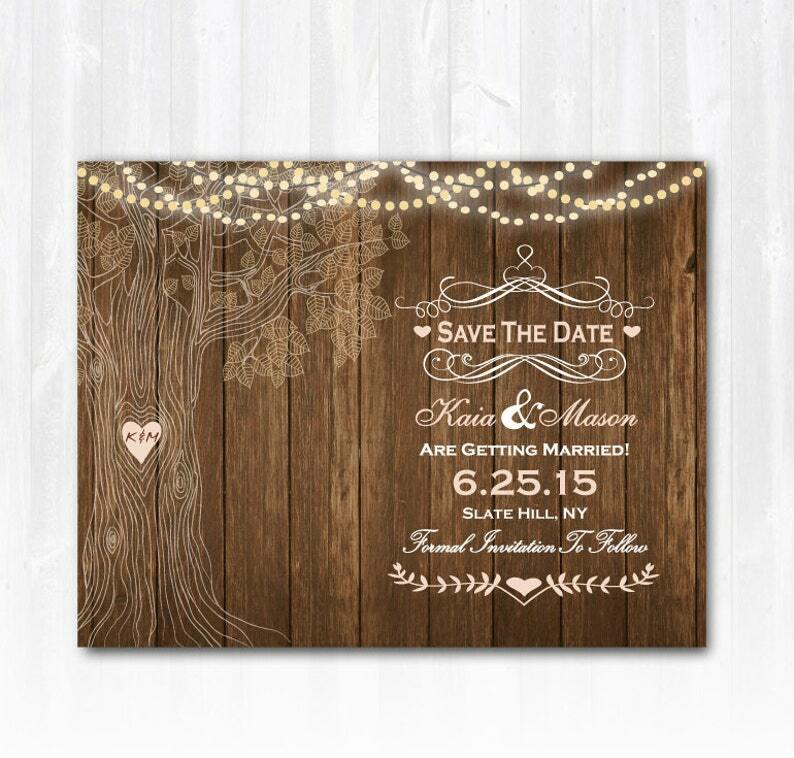 Tree Save The Date with String Lights. This Rustic Tree Save The Date with String Lights will be personalized with your choice of wording. This listing is for either Save The Date Magnets, Card Stock or a print ready DIGITAL FILE of this Country Save The Date with Tree. You have 3 Options in the Drop Down Menu. 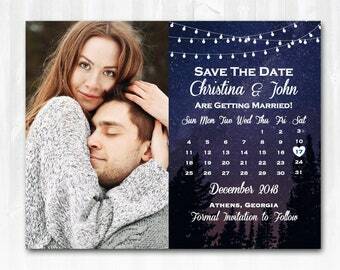 The Printed Save The Dates are available in many other quantities and size options. All of my Stationery is professionally printed on a State of the Art HP Press and includes high quality square flap envelopes. If you would like a custom quote on another amount or size please message me. >>>1. Save The Date MAGNET: 4.25"x5.5" 0.39mm thick MAGNET with Semi-gloss protective finish includes ENVELOPES. Shipping is included in pricing. >>>2. Save The Date CARD STOCK: 4.25"x5.5" 120lb Matte Premium CARD STOCK includes ENVELOPES. Shipping is included in pricing. >>>3. DIGITAL FILE: This listing is for a print ready, high resolution DIGITAL FILE ONLY of this Rustic Vineyard Save The Date (JPG or PDF) that you can take to print at the printer of your choice. If you want colors, fonts or placement DIFFERENT than shown in the examples contact me. If the changes are minor there will be no charge. For major changes there will be a small redesign fee. I have coordinating pieces for each of my Save The Date designs including: Invitations, RSVP Card, Hotel Card, Directions Card, Program, Thank You's etc. Please convo me for more information & pricing on coordinating pieces. This is my full time job so I answer emails and convos within hours if not minutes! Digital Proofs are sent within 36 hours, usually sooner, even on weekends! Wedding Planning is stressful and my goal is to take the stress out of your stationery needs! Check out my 700+ FABULOUS REVIEWS for peace of mind! Add this Custom Listing to your cart and checkout through Etsy. 2. Note any small changes that you would like to have made. 3. Attach 300 dpi, high resolution photo/s (if design includes photos) in a Conversation to me or email it to 'TreasuredMomentsCard@gmail.com'. Once payment is received and your custom details are received, I will then email you, within 36 hours, a high resolution digital proof for your approval. 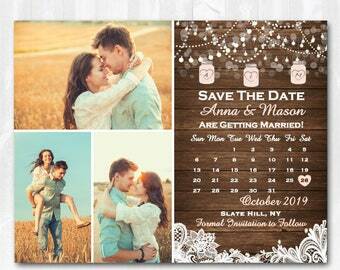 Upon approval your final files will be sent to print if you have ordered printed Save The Dates. They take up to 4 business days to print and then transit time. Submit your photos in .jpg format. Photos with a resolution of 300 dpi will produce the best results. I am not able to guarantee the print quality of a low-resolution photo. I uphold the legal rights and restrictions of all photographers. By submitting me your photos, you will agree that you are the photographer of the pictures or have permission from the copyright holder in the form of a copyright license. You will also agree to take complete responsibility for any misuse of copyrighted images and do agree not to hold me liable for any misuse of any copyrighted images. Professional Printing Services through Treasured Moments Cards are available if you do not order them at the time. Visit the •add printing• section of my shop: http://www.etsy.com/shop/TreasuredMomentsCard?section_id=14664668 for more information. Envelopes are included with printing services. NOTE: You may purchase printing services at the same time as your design or after your design is finalized. Visit my Policies page: https://tinyurl.com/y74mtvm8 for shop policies. By purchasing my listing, you agree to the terms listed above and in the shop policies page. Designs in the shop are copyrighted © by Treasured Moments Cards 2008-2018. They turned out just wonderful!